The ancient Greek city of Priene is in modern-day Turkey, but its Greek roots are clearly visible in the excavations you can visit. The remains of the city of Priene we can see today date back to the 4th century B.C.E., but it’s widely known among archaeologists that the original Priene settlement is much older. How much older, they can’t say - those remains are likely still buried - but it’s possible the original city was established before 1000 B.C.E. 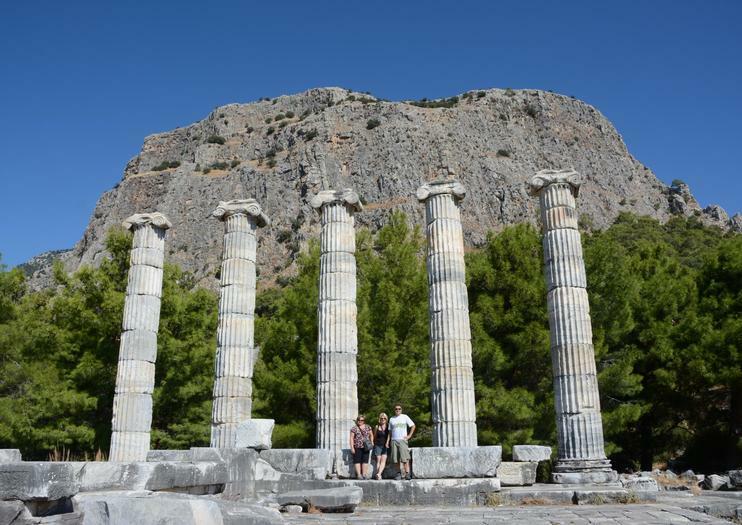 One of the main attractions at Priene is the Temple to Athena, situated at the highest point of the old city. Other sights in the excavations include a theater, the agora, a city council building called a “bouleuterion,” a gymnasium with Roman baths, and a Temple of Demeter. Priene is south of Kusadasi, although the drive is slightly more circuitous than the crow flies. It’s a 23-mile drive, best done by rental car or as part of a guided tour. The site is open daily from 8am-6:30pm (it closes at 5:30pm during the winter), and admission is 2 Turkish Lira per person. Didim was home to one of the mostfamous oracles of antiquity. The sanctuary was part ofthe illustrious city of Milet (Miletus in antiquity). Visitorsof Oracles”. The Temple of Apollo, built to honour Apollo,the god of the sun, arts, music and prophecy, became oneof the most respected sanctuaries of the ancient world,where visitors eagerly listened to cryptic omens of thefuture passed down by the oracles.